This document describes memory management for the ACRN hypervisor. The hypervisor (HV) virtualizes real physical memory so an unmodified OS (such as Linux or Android) running in a virtual machine, has the view of managing its own contiguous physical memory. HV uses virtual-processor identifiers (VPIDs) and the extended page-table mechanism (EPT) to translate guest-physical address into host-physical address. HV enables EPT and VPID hardware virtualization features, establishes EPT page tables for SOS/UOS, and provides EPT page tables operation interfaces to others. Host Virtual Address (HVA): the native virtual address space based on a MMU. A page table is used to translate between HPA and HVA spaces. In the ACRN, the HV initializes MMU page tables to manage all physical memory and then switches to the new MMU page tables. After MMU page tables are initialized at the platform initialization stage, no updates are made for MMU page tables. The ACRN hypervisor is the primary owner to manage system memory. Typically the boot firmware (e.g., EFI) passes the platform physical memory layout - E820 table to the hypervisor. The ACRN hypervisor does its memory management based on this table using 4-level paging. The BIOS/bootloader firmware (e.g., EFI) passes the E820 table through a multiboot protocol. This table contains the original memory layout for the platform. Figure 56 is an example of the physical memory layout based on a simple platform E820 table. The ACRN hypervisor runs under paging mode. After the bootstrap processor (BSP) gets the platform E820 table, BSP creates its MMU page table based on it. This is done by the function init_paging() and smep(). After the application processor (AP) receives IPI CPU startup interrupt, it uses the MMU page tables created by BSP and enable SMEP. Figure 57 describes the hypervisor memory initialization for BSP and APs. The hypervisor should use minimum memory pages to map from virtual address space into physical address space. If 1GB hugepage can be used for virtual address space mapping, the corresponding PDPT entry shall be set for this 1GB hugepage. If 1GB hugepage can’t be used for virtual address space mapping and 2MB hugepage can be used, the corresponding PDT entry shall be set for this 2MB hugepage. If both of 1GB hugepage and 2MB hugepage can’t be used for virtual address space mapping, the corresponding PT entry shall be set. If memory type or access rights of a page is updated, or some virtual address space is deleted, it will lead to splitting of the corresponding page. The hypervisor will still keep using minimum memory pages to map from virtual address space into physical address space. 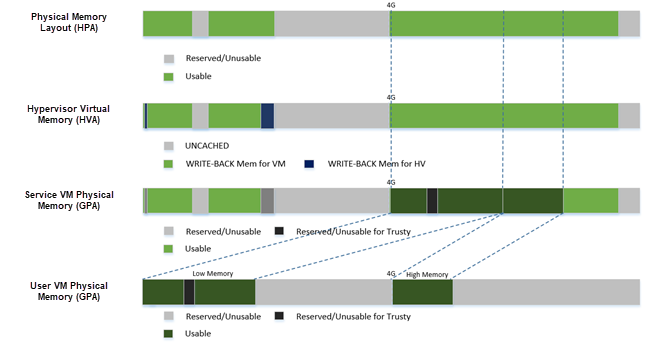 Memory pages pool functions provide dynamic management of multiple 4KB page-size memory blocks, used by the hypervisor to store internal data. Through these functions, the hypervisor can allocate and deallocate pages. 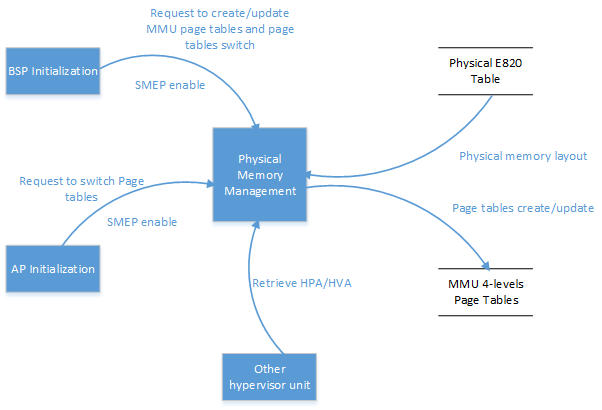 The physical memory management unit provides MMU 4-level page tables creating and updating services, MMU page tables switching service, SMEP enable service, and HPA/HVA retrieving service to other units. 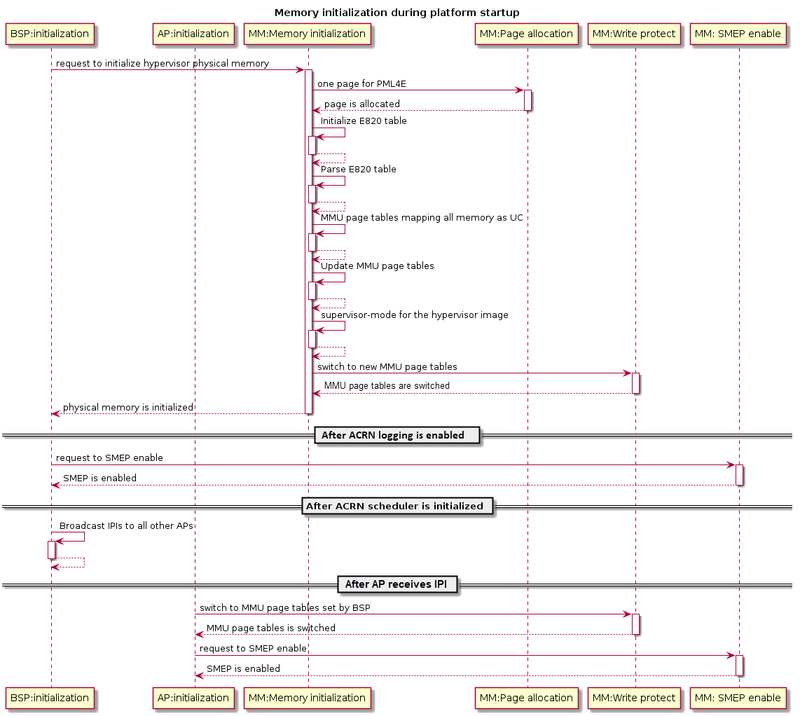 Figure 59 shows the data flow diagram of physical memory management. Supervisor-mode execution prevention (SMEP) enable. Translate host-physical address to host-virtual address. Translate host-virtual address to host-physical address. The hypervisor provides a contiguous region of physical memory for SOS and each UOS. It also guarantees that the SOS and UOS can not access code and internal data in the hypervisor, and each UOS can not access code and internal data of the SOS and other UOSs. provides services for data transfer between hypervisor and virtual machine. In the hypervisor, memory virtualization provides EPT/VPID capability checking service and EPT hugepage supporting checking service. Before HV enables memory virtualization and uses EPT hugepage, these service need to be invoked by other units. In ACRN, different memory space management is used in the hypervisor, Service OS, and User OS to achieve spatial isolation. Between memory spaces, there are different kinds of data transfer, such as a SOS/UOS may hypercall to request hypervisor services which includes data transferring, or when the hypervisor does instruction emulation: the HV needs to access the guest instruction pointer register to fetch guest instruction data. When hypervisor need access GPA for data transfer, the caller from guest must make sure this memory range’s GPA is continuous. But for HPA in hypervisor, it could be dis-continuous (especially for UOS under hugetlb allocation mechanism). For example, a 4M GPA range may map to 2 different 2M huge host-physical pages. The ACRN hypervisor must take care of this kind of data transfer by doing EPT page walking based on its HPA. When hypervisor needs to access GVA for data transfer, it’s likely both GPA and HPA could be address dis-continuous. The ACRN hypervisor must watch for this kind of data transfer, and handle it by doing page walking based on both its GPA and HPA. The hypervisor should use a minimum of memory pages to map from guest-physical address (GPA) space into host-physical address (HPA) space. If 1GB hugepage can be used for GPA space mapping, the corresponding EPT PDPT entry shall be set for this 1GB hugepage. If 1GB hugepage can’t be used for GPA space mapping and 2MB hugepage can be used, the corresponding EPT PDT entry shall be set for this 2MB hugepage. If both 1GB hugepage and 2MB hugepage can’t be used for GPA space mapping, the corresponding EPT PT entry shall be set. If memory type or access rights of a page is updated or some GPA space is deleted, it will lead to the corresponding EPT page being split. The hypervisor should still keep to using minimum EPT pages to map from GPA space into HPA space. The hypervisor provides EPT guest-physical mappings adding service, EPT guest-physical mappings modifying/deleting service, EPT page tables deallocation, and EPT guest-physical mappings invalidation service. In ACRN, the hypervisor only virtualizes MTRRs fixed range (0~1MB). The HV sets MTRRs of the fixed range as Write-Back for UOS, and the SOS reads native MTRRs of the fixed range set by BIOS. If the guest physical address is not in the fixed range (0~1MB), the hypervisor uses the default memory type in the MTRR (Write-Back). When the guest disables MTRRs, the HV sets the guest address memory type as UC. If the guest physical address is in fixed range (0~1MB), the HV sets memory type according to the fixed virtual MTRRs. When the guest enable MTRRs, MTRRs have no effect on the memory type used for access to GPA. The HV first intercepts MTRR MSR registers access through MSR access VM exit and updates EPT memory type field in EPT PTE according to the memory type selected by MTRRs. This combines with PAT entry in the PAT MSR (which is determined by PAT, PCD, and PWT bits from the guest paging structures) to determine the effective memory type. Virtual-processor identifier (VPID) is a hardware feature to optimize TLB management. When VPID is enable, hardware will add a tag for TLB of a logical processor and cache information for multiple linear-address spaces. VMX transitions may retain cached information and the logical processor switches to a different address space, avoiding unnecessary TLB flushes. In ACRN, an unique VPID must be allocated for each virtual CPU when a virtual CPU is created. The logical processor invalidates linear mappings and combined mapping associated with all VPIDs (except VPID 0000H), and with all PCIDs when the logical processor launches the virtual CPU. The logical processor invalidates all linear mapping and combined mappings associated with the specified VPID when the interrupt pending request handling needs to invalidate cached mapping of the specified VPID. The memory virtualization unit includes address space translation functions, data transferring functions, VM EPT operations functions, VPID operations functions, VM exit hanging about EPT violation and EPT misconfiguration, and MTRR virtualization functions. This unit handles guest-physical mapping updates by creating or updating related EPT page tables. It virtualizes MTRR for guest OS by updating related EPT page tables. It handles address translation from GPA to HPA by walking EPT page tables. It copies data from VM into the HV or from the HV to VM by walking guest MMU page tables and EPT page tables. It provides services to allocate VPID for each virtual CPU and TLB invalidation related VPID. It handles VM exit about EPT violation and EPT misconfiguration. 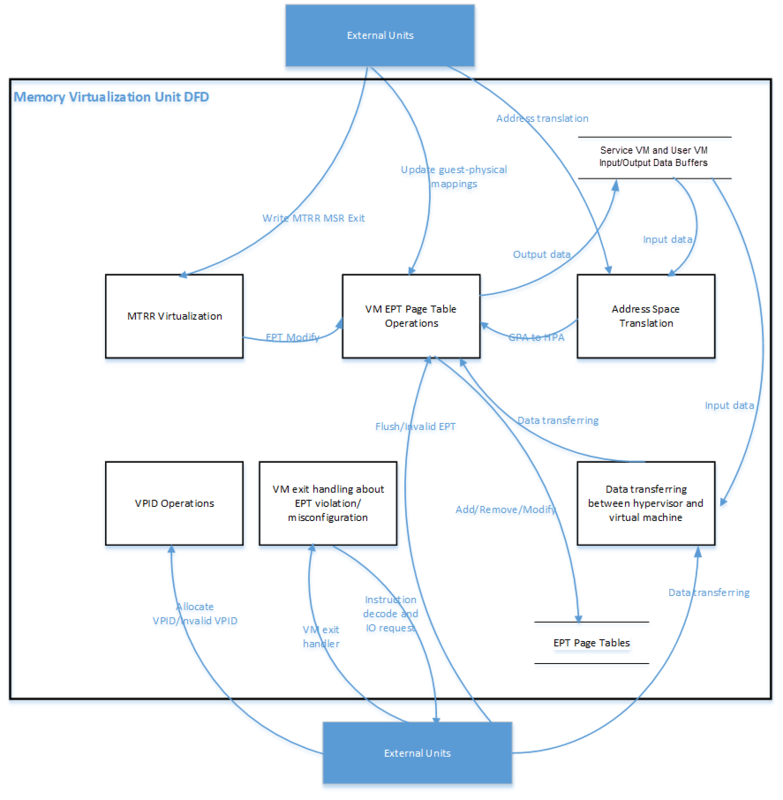 The following Figure 60 describes the data flow diagram of the memory virtualization unit. The memory virtualization unit interacts with external units through VM exit and APIs. There are two VM exit handlers for EPT violation and EPT misconfiguration in the hypervisor. EPT page tables are always configured correctly for SOS and UOS. If EPT misconfiguration is detected, a fatal error is reported by HV. The hypervisor uses EPT violation to intercept MMIO access to do device emulation. EPT violation handling data flow is described in the Instruction Emulation. Copy data from VM GPA space to HV address space. Caller(Guest) should make sure gpa is continuous. Copy data from HV address space to VM GPA space. Copy data from VM GVA space to HV address space. Copy data from HV address space to VM GVA space. Translating from guest-physical address to host-physcial address. Translating from host-physical address to guest-physical address for SOS_VM. : the gpa and hpa are identical mapping in SOS. Guest-physical memory page access right or memory type updating. Guest-physical mappings and combined mappings invalidation. After the ACRN hypervisor starts, it creates the Service OS as its first VM. The Service OS runs all the native device drivers, manage the hardware devices, and provides I/O mediation to guest VMs. The Service OS is in charge of the memory allocation for Guest VMs as well. ACRN hypervisor passes the whole system memory access (except its own part) to the Service OS. The Service OS must be able to access all of the system memory except the hypervisor part. The host to guest mapping is static for the Service OS; it will not change after the Service OS begins running. Each native device driver can access its MMIO through this static mapping. EPT violation is only serving for vLAPIC/vIOAPIC’s emulation in the hypervisor for Service OS VM. For an Android User OS, there is a secure world named trusty world support, whose memory must be secured by the ACRN hypervisor and must not be accessible by SOS and UOS normal world.